A child throwing a tantrum. The definition of a tantrum is a fit of anger or frustration. 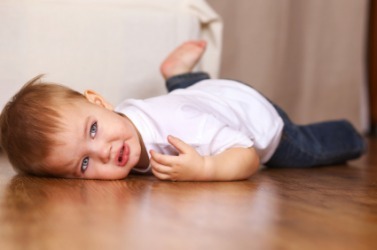 An example of a tantrum is a child throwing themselves on the floor when they don’t get what they want. "tantrum." YourDictionary, n.d. Web. 09 April 2019. <https://www.yourdictionary.com/tantrum>. A fit of bad temper. Also called Also called regionally hissy 2. Also called hissy fit . An often childish display or fit of bad temper. Many parents become embarrassed by their children throwing tantrums in public places. Baby Shawn threw a tantrum when he was told the bicycle was not his. Permissive parents often "give in" to their children's wishes, hesitating on boundaries as soon as their child protests, gets angry, throws a tantrum, or expresses disapproval in some way. The woman claimed to have seen Heath Ledger doing drugs before his tragic death and also made claims that she was once the personal assistant to tantrum prone model Naomi Campbell. The tantrum occurs because the small child, who is still learning to cope with her feelings, is simply unable to contain strong emotions of anger, frustration, or disappointment. Whenever possible, they should remove the child to the car or some other private space to avoid inconveniencing others and attracting any more unwelcome attention, after which they should ignore the tantrum and let it run its course. A tantrum is an episode of extreme anger and frustration characterized by crying, screaming, and violent body motions, including throwing things, falling to the floor, and banging one's head, hands, and feet against the floor.